"A strange Constellation of Events" assembles a long series of musical experiments which began soon after the release of "Apparitions." Searching for new musical ground, the duo (Brian McWilliams and John Phipps) began exploring alternate modes of composition, never settling on the same method twice. As a starting point, they wanted to explore the subtleties of communication, from the man-made to the terrestrial. But, what began to emerge seemed to paint a larger picture - an audio portrait describing the deep veil of night and the arc between dusk and dawn. 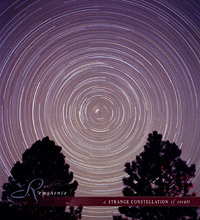 Here, on their fourth release, Remanence explores the in-between time with the sound of insects and frogs, the pulse of fireflies - the night time lighting up in a dazzling array of stars. Its music about the nocturnal (and for the nocturnal), both peaceful and ominous. There are stories of communication, moments of deep reflection... The music unfolds then slowly drifts away in hushed, muted silence. "Strange Constellation" is night music - deep, layered and textured - coaxed from a long line of soundscapes and musical experiments and blended with a careful selection of night-time field recordings. Like all our releases, it ships with beautifully printed artwork in unique packaging and includes a velum insert, insect photos, and detailed liner notes. Front cover photo by John Chumack. Please visit www.GalacticImages.com for more information. Carolyn Koebel: bowed gong, cymbols and ocean harp on "A Reply Beyond Oblivion"
Mastered by Brian McWilliams at The Sound Observatory, 2004-2005.